Welcome Lisa Desrochers of Personal Demons and the upcoming Original Sin. She's brought Gabriel with her today to answer a few questions. Alison: Welcome to my blog Gabriel. I'm so grateful you could take a few minutes away from your busy life as an angel to answer a few questions. 1. You've lived for thousands of years. What was your favorite time period? Picking a favorite is tough. My least favorites are easy: the world wars, the Crusades, the witch trials, both in Europe and America. But my favorite…? The Renaissance was fun. And there’s always Woodstock. 2. How did you and Luc meet? Hmm… I believe we first met in Pompeii after Vesuvius …but it could have been the Colosseum. It all blurs together after a few eons. No…It was Vesuvius…I remember because, Luc show up all cocky, thinking he’s all that. Going to collect all these souls after the eruption. He was an Acquisitions rookie then and didn’t know how to tell when someone was tagged for Heaven. It was a riot watching him try to wrangle Heaven-bound souls to Hell…and falling flat on his face. 3. In some cultures, white is considered the color of death. Do you radiate a different color for those people (along with a different decorating scheme for your house)? Mortals are limited by self-imposed parameters. Just like any celestial of the upper spheres, I am not finite. Everything about me is a reflection of the observer. If Frannie describes me as radiating white, that’s because that’s her perception. As far as my decorating preferences, white coordinates with everything. So, that’s basic laziness. 4. What is your favorite part of Heaven? I’m not sure if you mean literally, as in a physical location, or figuratively, as in a certain aspect. So, since there are very few physical locations inside the Kingdom—no beaches or nightclubs—I’ll go with the aspect I enjoy most…and that would be witnessing the instant just before someone is tagged for Heaven. There’s a shift. It’s fun to watch. Also, I like the coffee. It’s really good. 5. What was the first thing you thought when you met Frannie? First thing…? She’d grown up a lot. I first Shielded her when she was seven — when we realized she was special. The Shield worked until Luc showed up, so I hadn’t been back. She was…bigger. 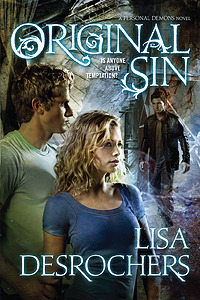 Lisa was kind enough to offer Alison Can Read readers a signed galley of Original Sin. Enter to win! Um Gabe? Perhaps you want to expand on your definition of "bigger" for Frannie so she doesn't take it the wrong way;) And I have to say, I am now very curious as to what Heaven's coffee tastes like. Such a fun interview Alison and Gabe! Fabulous questions (I especially like the one dealing with white and individual perception) and equally entertaining answers. LOL I love how he met Luc!! Thanks for the giveaway, and a great interview. I never would have thought he decorated in white because of laziness, I guess all men are the same. Angel or not. A fun interview! Thanks for sharing. I saw "Gabriel" and swooned a bit. I'm shocked though, that he would actually be, and admit to being, lazy! He's funnier than I remember him being, though. The coffee? Frannie's size? I'm with Jenny on that, Gabe! What do you mean by bigger? And oh, thank heaven that there is good coffee up in.. well, heaven! Another thing to look forward to! Excellent interview. It was so fun to read. Hmm..I'm guess he meant "bigger" as in tall and now a woman instead of a child? Let's hope Frannie understand what's he's trying to say. I'm also curious as what coffee heaven tastes like. Coffee on Earth is a bit too bitter for me. I wonder how tea is up in heaven. Thanks for a really fun interview and giveaway. I'm not entering bc I have an ARC of this, but great giveaway, Alison! That was fun. Thank you. I'm not entering as I just won an ARC. Can't wait for it to arrive :). This is so fun! I have Personal Demons on my shelf but haven't gotten to it yet. Bad Logan! Thanks for the giveaway! Thanks for the giveaway. I haven't heard much about Gabriel so it's nice to see an interview done with him. Great interview and giveaway this book sounds awesome! I never knew white was considered the color of death in other cultures. Interesting. Thanks for entering me. I need to move to America so that I can be a part of all the best giveaways! Thank you for sharing fun interview! Thank you for the great giveaway can't wait to read it!